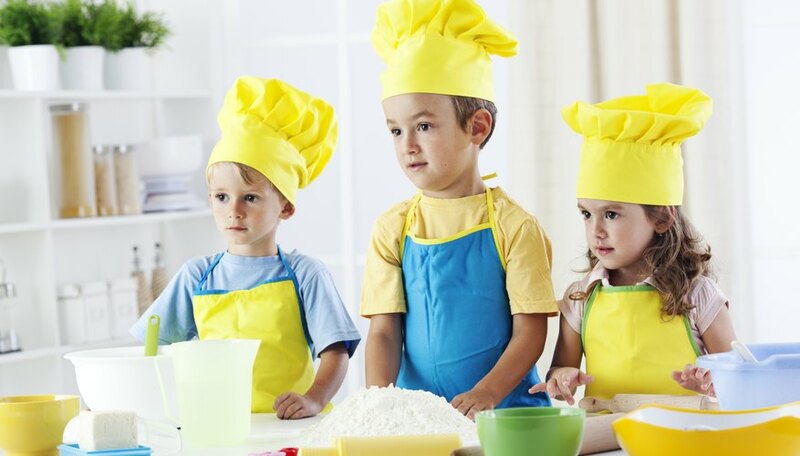 Cooking is a skill that everyone needs throughout life, and it is never too early to learn how. Teachers can use cooking to teach about cultures, measurement, sequencing or simply for fun. Teach kitchen safety and proper hand washing before you begin. If you are not in a culinary classroom, obtain a portable electric single or double burner stove. Steps within recipes can be assigned to different students to ensure that all the kids actively participate. Tortilla chicken soup is nutritional and easy to cook, and it's featured in the "White House 2014 Healthy Lunchtime Challenge Cookbook" as a winning recipe. Start by peeling and chopping a medium onion and mincing two cloves of garlic. Sauté the onions and garlic in a heavy stock pot. Add 2 tablespoons chili powder, 1 tablespoon cumin, and one whole, deboned rotisserie chicken cut in cubes. Cook this for four minutes. Add four 14.5-ounce cans of diced tomatoes, two 15-ounce cans of black beans, one can of drained sweet corn, and two 15-ounce cans of chicken broth. Bring the ingredients to a boil, then simmer for 30 minutes on low heat. Serve the class in bowls with garnishes of your choice, such as tortilla chips, avocado, sour cream and shredded cheese. Yams are a root vegetable that is easy to prepare in African sweet potato stew. Use the portable stove to warm olive oil and sauté two peeled and chopped yellow onions for five minutes. Add four minced cloves of garlic, two chopped and seeded red bell peppers and four peeled yams cut in to ½ inch squares. Then add two 15-ounce cans of drained great northern beans, one 15-ounce can of diced tomatoes and six cups of vegetable broth. Stir well and season with 1 tablespoon brown sugar, 2 teaspoons fresh grated ginger, 2 teaspoons ground cumin, ½ teaspoon salt, ¼ teaspoon black pepper, 1/8 teaspoon allspice, 1 ½ teaspoon ground cinnamon and ¼ cup peanut butter. Bring this to a boil, then reduce the heat to a low simmer for 30 minutes. Serve it while it's hot and talk about other roots that are edible, such as potatoes and carrots. Chocolate truffles are a tasty dessert that kids like to taste-test. This two-part recipe should be used with students that you have for the full day, such as elementary students. Start it in the morning and finish it in the afternoon. On the stove, melt butter on low heat. Add ¾ cup unsweetened cocoa powder and stir. Let this cool, then add one can of sweetened condensed milk and 1 teaspoon vanilla extract. Place in a refrigerator for three to four hours. Use the refrigerator in the teachers’ lounge if you don’t have one in the classroom. In the afternoon have the kids roll the chocolate goop into little balls and then roll the balls into powdered sugar for a cool treat. One of the best ways to learn about cultures is through food. Kids also learn new words associated with a culture by cooking foods from other parts of the world. Asian lettuce cups, or san choy bau, gives kids a chance to enjoy healthy ingredients and Asian flavors. Have each student tear off a lettuce leaf from a head of lettuce and soak it in iced water. In the meantime, use a frying pan to heat 1 tablespoon of oil and one minced clove of garlic. Brown 2 pounds of ground pork and drain the liquid. Reduce the heat and add 2 tablespoons of oyster sauce and 2 teaspoons of fish sauce. Cook for two minutes, stirring to combine the ingredients well. Toss in a few chopped green onions and fresh cilantro. Drain the lettuce leaves and spoon the hot mixture onto them. Serve the lettuce cups immediately. Epicurious: White House 2014 Healthy Lunchtime Challenge Cookbook -- The Winning Recipes! McKinley, Shelley. "Cooking With Kids in the Classroom." Sciencing, https://sciencing.com/cooking-kids-classroom-5166015.html. 24 April 2017.